The thing about humans is, you try and do something nice for them, and then they throw it back in your face by raising an army and going to war. Even innocent things, like building a bakery so they don't starve, will result in more soldiers prowling the floating island you watch over. Well, at least they can defend themselves from bandits... No, wait, they're charging head-first into a big Greek mythological monstrosity. The other thing about humans is they're kind of dumb. That's what you'll have to deal with in Skyward Collapse, the turn-based 4X god game from AI War developer Arcen Games. You play as The Creator, who is attempting to help two warring civilizations thrive, without letting either get advanced enough to wipe out their rival. It's an interesting twist on the god 'em up genre, and it's out now through Steam and the developer's website . 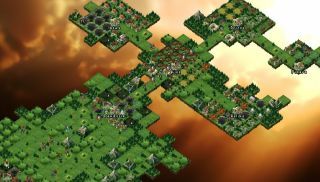 Each turn you alternate between the two factions, placing down buildings and mythological units in order to balance the scales of an escalating conflict. As such, your biggest antagonist is usually you past-self - who you'll come to resent as the careless jerk that over-empowered one side, and left you desperately scrabbling to bolster an increasingly crippled faction. Skyward Collapse is currently available at a 10% discount on Steam , selling at £3.59 for the next week.